Delta Airlines operates Airbus A350-900 during International flights. Airbus A350-900 operated by Delta Airlines may accommodate 306 passengers in 3 classes. First 9 rows consist of 32 open suites. These seats are seats of Delta One type. The seats of the 1st row are standard but have such a disadvantage as close location of the lavatories in front. Close location of the lavatories and galley may also cause discomfort to passengers of the seats 9B and 9C. Behind the seats of Delta One type 6 rows of Delta Premium Select seats are located. These seats have 2-4-2 configuration. The seats of the 20th row are considered the best seats of this type because passengers of these seats will be able to take advantage of extra space for their legs. However, these seats have no floor storage during take-off and landing and are a little reduced in width due to built-in entertainment displays in the armrests. 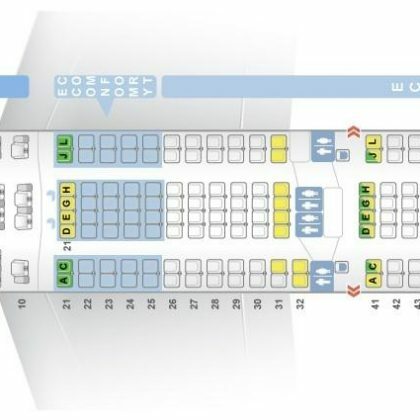 Economy class offers 226 seats that are divided into 2 sections. First section consists of 10 rows of seats that have 3-3-3 configuration. Passengers of the seats of the 30th row will feel comfortable thanks to additional space for their legs. Among disadvantages of these seats: reduced width because the tray tables are in the armrests and lack of floor storage during take-off and landing. The only disadvantage of the seats of the 39th row is location of the lavatories behind. Behind exit row second section of economy class seats is located. There are16 rows of seats here: 14 rows have 3-3-3 configuration, 1 row has 2-3- configuration and 1 row with 3 seats. Thanks to the exit row located in front the seats of the 40th row offer extra legroom. At the same time other passengers tend to congregate in the area of these seats while waiting to use lavatories causing discomfort to passengers. Also, these seats have no floor storage during take-off and landing and have slightly reduced width. 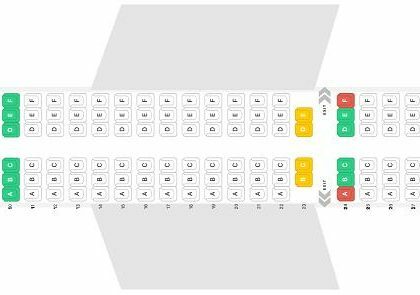 The best seats in this section are considered the seats 41A and 41J because they offer additional legroom due to missing seats in front. The main disadvantage of the seats 54D and 54F is location of the galleys behind the noise from which may be bothersome. Limited recline, reclining seats located in front that reduce personal area of passengers and location of the galleys behind make the seats 54ABC, 54 GHJ and 55DEF bad seats.